Been home now more than a week and the trip has pretty much completed its orbit from experience to memory. But if I squint just a bit I can still just see a bit of trip light over the western horizon. Here are a few of our favorite photos from that time still not so long ago. A Bristlecone pine tree at Great Basin National Park- one of the oldest living things on the planet this tree is likely two thousand years old! Somewhere between Durango and Silverton, Colorado. About an hour after taking this photo we were hit by several falling rocks including one that damaged our windshield. In Naturita, Colorado we do the unthinkable. We spend the night in an RV. Was pretty comfortable actually. Great Sand Dune National Park. As good as it gets. Henna walking toward Moulton’s Barn in Grand Teton National Park which was part of a Mormon settlement that existed into the mid 20th Century. After almost 7,800 miles, 48 nights (and 29 spent in a tent), 8 national parks, 3 nifty sand dunes, 3 bear encounters, 1 chipmunk encounter (the sucker ran up the mesh of the tent a few inches from my face), 1 poorly scripted fake gun fight (Dodge City, KS), 6 nights spent on the California/Oregon coast, 1 attack by falling rocks (between Silverton and Ouray, CO), and 1 prophet (outside of Kansas City, he warned of rain on the 4th of July) we are finally home. And by home I mean a place where every short walk results in several long conversations. Our home home. We do though have more stories to tell of our unscripted 2017 Great Summer Trip. 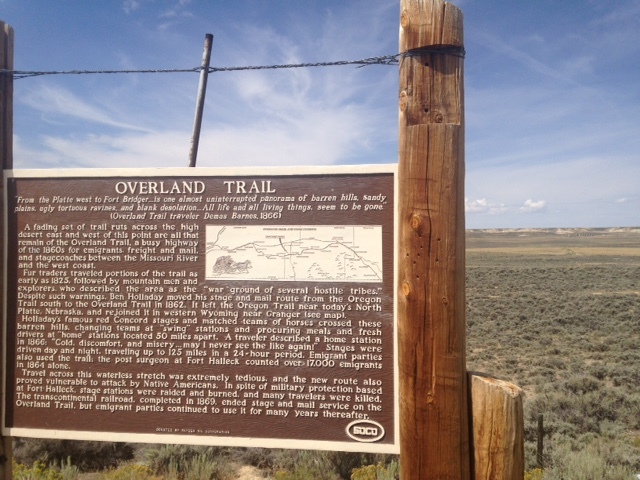 Like the former Japanese American Internment Camp in Southeastern Colorado we visited. Or the funky opera house in tiny Eureka, Nevada. And of course more talking politics with strangers. But for now we leave you with a few more photos to look at while we unpack. The treacherous seas that lie within Denver’s City Park. Note Henna’s shoe floating away. Denver’s City Park is just a short drive away from the capital building. At 330 acres it is an impressive green space and includes a zoo, many trails, and a small lake. If one is foolish enough to do so, you can also rent a paddle boat or, as Henna and I did, a water tricycle. Lighter than the more conventional paddle boat, the water tricycle is a bit difficult to navigate in tricky waters. And the seas were indeed rough the day Henna and I set off to explore the outer watery reaches. So much so that Henna lost her shoes (she set them aside on the boat prior to setting off and then later they fell off the side). Did I mention the tricycle is difficult to steer? We did quickly save one shoe but the other drifted ever so slowly away from us. Try as we could, and believe me we did try, we could not capture the overboard sneaker. Luckily it drifted back to shore where Corey was able to spear it with an oar. Bad shoe. Despite nearly twenty years of travel under our belt, we had never actually spent more than a few minutes in Denver. But lucky for us, our niece/cousin Kristine moved to Denver a few months ago and there was no way we would miss the chance of hanging out with her. Although it is hard to gauge a city after only a few hours, we think we like Denver. Not love, but like. Remove Denver from the mountains and you would have a serviceable enough city but not somewhere people would go out of their way to visit. But so far as we know Denver is not moving further away from the Rockies and for this reason alone it is a pretty cool city. Several days a week food trucks are allowed to set up near the state capital. Baggo games are also encouraged. After spending much of last summer explaining why there was no way America would ever elect Donald Trump, I was hoping this time around to gain a little insight into how America did just that. Yes, many more Americans did actually vote for Hillary than Donald. But so what. The electoral college ain’t going anywhere and for at least the next four years either is the duck. But political conversations with strangers are a dicey proposition. The ones I did cajole usually resulted in voiced opinions not too dissimilar from my own. A retired fire fighter from Boise, for example, credits his city’s high quality of life with its progressive values (he called it a shiny blue dot in a sea of red). Other pleasant surprises included the beat up pick up truck that passed us on Route 50 in Nevada. It had the same Human Rights Campaign sticker that we have. And then last night in Rock Springs, Wyoming there was not one but two gender non-conforming individuals working at our hotel. Parts of red Montana, like Missoula, swing further to the left than Chicago and even in remote Idaho we saw a highway adopted by the local Democrat chapter. People nowhere fit an exact mold. 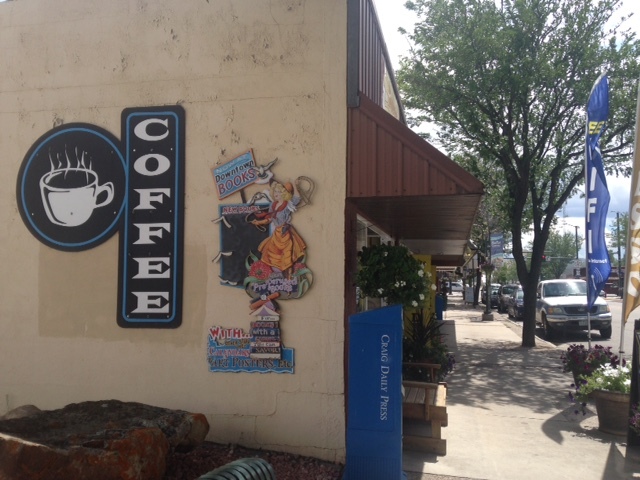 Maybe the best conversation (political or otherwise) happened today at a lovely coffee/book shop in Craig, Colorado. Seated next to us was the former mayor who explained to us how Craig, principally a ranching and coal mining town, was more politically aligned with Wyoming than it was with nearby Steamboat Springs. The mayor, another blue dot in a sea of red, was as articulate as he was personable. A soothing cup of coffee at the end of a long ride and a reminder of how great conversation can be. About sixty miles south of Grand Teton National Park is Pinedale, WY. Their official slogan is “All the civilization you need!” Not so sure about that one, but the town does have a nice deli, a brew pub, and the very interesting Mountain Man Museum. It was a wonderful week spent camping at our favorite national park. On Sunday we rolled into the less popular Gros Ventre campground then bolted the next morning to Signal Mountain. We arrived on August 7th which, given the fourteen night maximum stay, meant we could have planted ourselves right smack dab in the solar eclipse path. That is in fact exactly what many of our neighbors did. But after six weeks traveling the country we were itching to get back to our non canvas home. The magical campground in Garibaldi, Oregon which is located on the grounds of a former mill. Besides being a fountain of free crab meat the place also supposedly never fills up due to its large size. I call the big sprawling campground in Garibaldi, Oregon (about 55 miles south of Astoria) magical mostly because of the free crab meat. Patty, the caretaker/campground angel, brought us over four whole soft shell crabs as a thank you for visiting Oregon (and also because her grandson, like us, lives in Illinois). Already cooked, she cleaned the shell fish in front of us and we were good to go. Then the next morning our fisherman neighbor gave us another crab for the road which we later clumsily cleaned for lunch. Besides crabs, coastal Oregon gave us plenty of good conversations including one with our (we hope) future selves. It happened at the farmers market in Newport, Oregon where the food stalls were all a family affair with little kids helping their parents serve up delicious eats like kimchi and gourmet grilled cheese sandwiches. Twice in Newport we told someone that we were from Chicago and they immediately mentioned “Wait Wait…Don’t Tell Me!” My parents remember a time when people associated Chicago with Al Capone. In the 1990s it was Michael Jordan. Now it’s Peter Sagal. Anyways, while sitting at a picnic table eating our Japanese noodles and grilled cheese sandwiches, this couple sat down next to us and we began to talk about campers. They had made the leap from tent camping to recreating in a modified, fully self-sufficient Sprinter camper. They also exuded a genuine calming aura that lulled us completely out of our petty trip related concerns (specifically where we were going to spend the night) and into the present. Just prior to lunch we contemplated paying $60 to camp at the KOA in Astoria. This would be by far the most we ever paid for a campground but given the scarcity of campsites over the weekend it seemed a better choice than maybe paying twice that for a motel. After talking to our new friends we knew that was crazy. So instead we ate lunch, strolled the waterfront (one side of the street Ripley Believe it Or Not museums and t-shirt stores, the other a working dock), and then meandered down the road. Later we discovered the magic campground and met Patty. I cannot think of a better way to finish the Oregon coast. So there we were in Redding, sweating it out at 100+ degrees, and having to decide whether to 1) go up Interstate 5 to Mount Shasta and then Crater Lake or 2) hit the coast. We chose the latter and then spent four lovely nights camping from the Redwoods near Eureka, CA to the gentle waters of Sunset Bay, Oregon. In California, at a private campground, my full bladder woke me in the middle of the night. While taking care of business I looked up and saw a very large bear less than fifty yards away from me. The bear was sniffing the grass like the skunks do by my house in Chicago. He/she did not register me in any way. I went back to the tent and then debated whether or not to wake up Corey and Henna. They were sleeping soundly, the bear did not seem out for tourist blood, so I tried to go back to sleep. Twenty minutes later I peeked out the tent and the bear was nowhere to be seen. It took me at least another hour to fall back to sleep. That was actually my second bear encounter or third if you count the time in Ouray (a small bear ran through the campground near our tent). The other encounter was in Plumas-Eureka State Park. Corey and Henna drove to the main visitor center but I decided to walk the pleasant mile and a quarter along a creek trail. About halfway down the trail I came across three women walking together. In response to hearing my footsteps behind them they whirled around to face me. One lady was carrying a heavy branch. They told me there was a sow and a cub just up the trail. There were four of us so we decided to walk forward. As we did so I told a joke that I have heard my dad tell dozens and dozens of time about two boys being chased by a bear. The punchline is that one boy tells his friend that he only has to outrun him (and not the bear). The joke went over well and I never actually did see either of the two bears (although supposedly they watched us the whole time). A great cup of coffee in Langlois, Oregon led to us finding one of Oregon’s premier kite surfing destinations. We met a lot of other really cool people. Sometimes though the conversations went a little off. Like the ranger we met who, when told we were from Chicago, assumed that we had seen the last Grateful Dead show (Jerry Garcia died shortly after playing Soldier Field). Corey actually was at that show and so joked “I actually killed him.” Dead silence. Or, again in Plumas, I told a woman that it was a three mile hike to Rock Lake. She then asked how long it was round trip. Our third massive sand dune of the trip was at Oregon Dunes National Recreation Area. This is likely our last night on the coast and is spent at a motel a little south of Newport. As for tomorrow, well, who knows where we will go. After spending some time on the Loneliest Highway we were a bit overwhelmed by the over loved (and, yes, very beautiful) Lake Tahoe. Heavy traffic everywhere and most hikes involved a lengthy weight just to park the car at the trail head. There also was quite a bit of smoke coming from forest fires both to the east of us as well as from the Yosemite area. Our original plan in fact was to head to Yosemite but all that smoke pushed us north into Plumas Eureka State Park. Located at about 5000 feet, temps reached the mid 80s during the day but then dropped twenty degrees at night. We camped there three nights and saw more shooting stars than clouds. And the only thing better there than the hiking was the mountain lake swimming. Leaving the state park we headed to Lassen Volcanic National Park where we saw 1) a helicopter rescue from the visitor center (no idea what happened) and 2) a lot of snow. And by a lot of snow I mean snow banks over ten feet high. The main park road usually opens mid-May or early June. This year it opens up in a few days. So we drove as far up as possible then walked a bit on the eerily quiet pavement. Maybe a few snowballs were also thrown. Then less than ninety minutes later we were chillin at a hotel in Redding where the temperature outside is over a hundred degrees. If you want consistency then stay out of California. Swimming at Rock Lake in Plumas Eureka (3 mile one way easy to moderate hike with great views of the Sierras and one awesome mountain lake to swim in). Remnants of the Jamison Mine which operated into the 20th Century. Cool outbuilding and other artifacts can be found throughout Plumas Eureka State Park. Your safety is never guaranteed. A helicopter rescue from a visitor center at Lassen Volcanic National Park. The helicopter landed in the corner of the parking lot about 25 yards from where we stood. Due to the heavy snow that fell last winter car bound traffic (for now) can go no further although cyclists and hikers are allowed as far as they want to go.